Terror on the Boulevard is a home haunt located in Lincoln Park, Michigan that has been in existence for a decade; it’s a labor of love for Adam Grignon. Like many home haunts, Terror on the Boulevard is open to the public free of admission, but is only operational a couple of nights each October. I first learned of Terror on the Boulevard in 2012 while working as a substitute teacher at Carr Elementary School. I did attempt to attend that year on Devil’s Night but was thwarted by the aftereffects of the appropriately named, Frankenstorm. Three years to the day, I returned with my faithful haunt companion, John, by my side to finally tour Terror on the Boulevard. We encountered Adam at the entrance of his home haunt, dressed in the fashion of a father from the 1950s complete with sweater vest and pipe. He ushered us eager kiddies into his creation which we would soon discover was home to the Boogeyman. The interior of Terror on the Boulevard wasn’t so different from your own home, specifically a child’s bedroom. One hallway was decorated with wallpaper, family photos and even a vintage radio that quietly transmitted a period correct song that reinforced the Boogeyman theme. John and I would note that the attraction was professionally lit which is not a feat easily accomplished at an outdoor home haunt. Fog machines were also implemented in an appropriate manner — the effect wasn’t overdone so that it blotted out details rather it created the impression that perhaps a small fire had recently occurred somewhere in the house. Adam was a bit short on help on the night of our visit and that did impact what I’m sure would have been an excellent signature scare. On one wall was scrawled a message that warned “Don’t look under the bed.” We noticed some skirting near our ankles and naturally couldn’t resist the temptation. Adam later informed me that a pair of oversized hands were scheduled to assail those who were curious enough to look. I have no doubt it garnered the lion’s share of shrieks during the hours of trick r’ treating. As it were, the most memorable scare delivered to John and I came in the largest room of the haunt where a series of sheets had been fashioned into floating ghosts. We bobbed and weaved our way through the white figures, prepared for one or more to reach in our direction. All was still for several agonizingly long moments and just when we thought we were in the clear — SWOOSH!!! One expertly disguised ghostie alerted us to the fact that he had some life in him yet. Dead Vengeance is a four-part series published by Dark Horse Comics. The first issue was released October 2015 with subsequent issues released monthly from November 2015 to January 2016. The series was written and illustrated by Bill Morrison, a native son of Lincoln Park, Michigan. Steve Colwell, who has served as co-host on several episodes of Horrorlust Radio, turned me onto Dead Vengeance. Steve also hails from Lincoln Park; he and Bill have been friends since childhood. Lincoln Park also happens to be my boyhood home! It’s not every day that you get the chance to read a horror story created by somebody from your hometown, so it only seemed natural to highlight Dead Vengeance here on Horrorlust. The tale of Dead Vengeance begins in May 1940 at a carnival on the outskirts of Detroit. The very first panel reveals a carnival barker in front of a sideshow tent affixed with a sign that reads, “Cavalcade of Oddities.” Once inside the tent, readers will discover a mummified Fiji Mermaid but more importantly will be introduced to the central protagonist — a pickled man who unconsciously floats inside of a large tank. As the above cover art suggests, our new friend won’t be unconscious for long. And like that, I was sold. Readers soon learn that Pickled Man is actually Johnny Dover, a one-time popular radio host out of Detroit. So how did this guy end up preserved inside of a tank full of chemicals at a carnival?! In order to find out you’ll just have to snag a copy and read for yourselves, my friends. The story also features a voluptuous fortune teller, a legless freak named Cesar and even Detroit’s infamous Purple Gang! 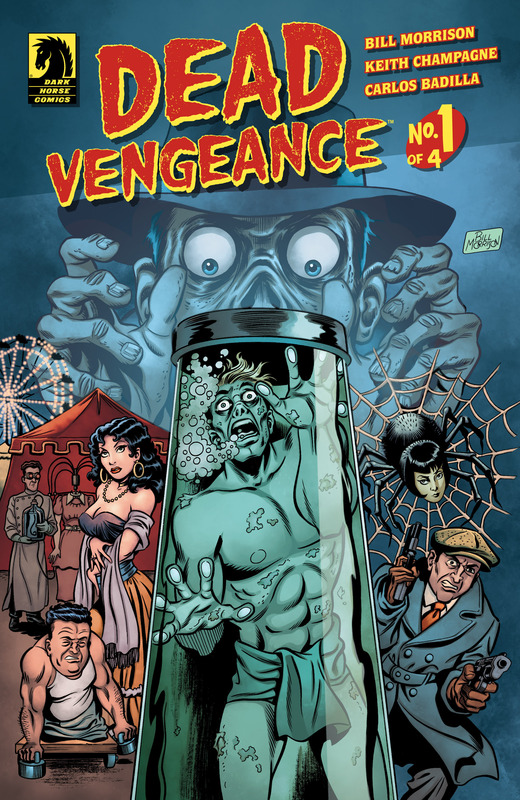 Dead Vengeance is a fun, fast-paced read stuffed with action, intrigue and capped-off with a classic twist in the tradition of EC Comics! It was neat too that creater, Bill Morrison, gave a nod to his hometown roots with a mention of area cities like Lincoln Park, Wyandotte and Flat Rock. Readers will also recognize familiar Detroit landmarks like the Ambassador Bridge. Dead Vengeance can be found at your local comic shop for $3.99 and should be enjoyed by any lover of horror but especially those who call Southeast Michigan home. We got a later start than we had originally intended which cost us a visit to Rotten Manor for the time being but Devil’s Night 2015 turned out to be another fun entry in our haunted history. All was quiet when we arrived at our first stop — Terror on the Boulevard, a home haunt in Lincoln Park. The little haunt was neatly themed, well detailed and an all around good time. Brave trick r’ treaters should be aware that it will be open once again tonight from 7-10pm so don’t miss your chance to confront the Boogeyman! Our next stop was Hush in Westland where the once mighty corporation was found in a ruinous state. Dr. Phun may be dead but the halls of Hush had no shortage of creepy crawlers — I was even assailed from above by a diminutive pygmy creature! The back-end of the attraction in particular was positively littered with freaks and ghouls who dialed it up to ten as all hell broke loose! The final stop of the night was a return to Dark Legacy in Wixom, now in their second season. The haunt had been fitted with new scenes, gags and a completely redesigned Fang Cemetery. In particular we enjoyed a handful of inventive scares, several highly detailed scenes and the cast which we found to be collectively superior to their 2014 counterparts. Full reviews to be posted in the coming weeks.